This is one of those lamp I said to myself why didn't I think of it! I like the idea of a lamp with multiple rings that settled on top of each other. The odd thing about this lamp is that I feel it has a lot of movement to it. Almost like a slinky in action and before the it can settle, someone captured a quick photograph of it. At the same time, it feels like it's a night light (ie calming). Almost like one of those light you turn on to create a romantic mood in your bedroom or you put it on a patio table when you are hanging outside with friends.... like a votive of some sort. My aim is to create lights that express the rhythms of life. I search for new forms through deconstructing old ones. That creates a shadow play with positive and negative shapes and different planes that I find very fascinating. The light opens up the inside of the form. Respecting the nature of clay, I respond to the form by rearranging the spirals and marvel at the collaboration that transpires when the work is consecrated to the fire. 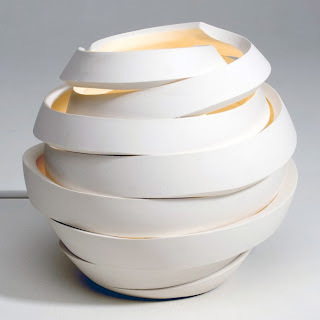 I choose smooth white porcelain and translucent porcelain and a potter’s wheel to make the initial form. The form is cut with a sharp knife and I rearrange its elements, thinking of the pyroplastic qualities of porcelain in the high firing and in the black firing. Szilvia not only does pottery, but also silver jewelry as well. All her work seems to have kinetic energy. 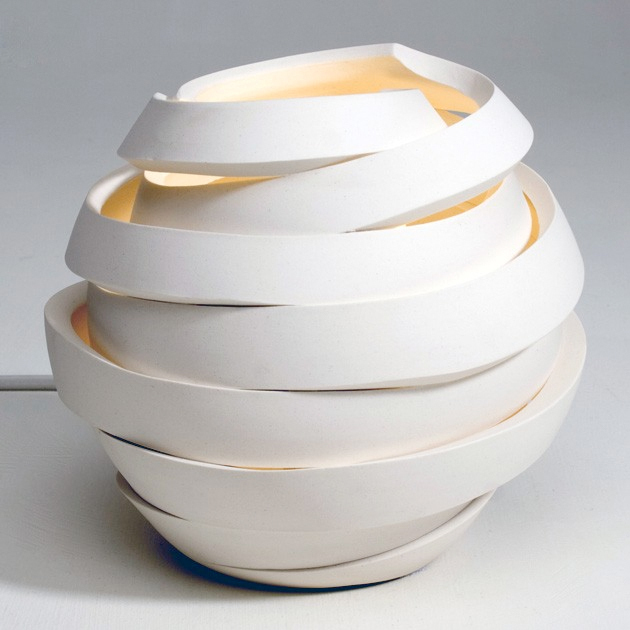 Gyorgy lamp can be ordered here.